We know that this is one of the hardest moments in your life, when you have to decide to end the life of a beloved companion. It may happen unexpectedly as a result of an accident or a sudden discovery of a terminal illness, or at the end of a gradual decline due to debilitating illness. 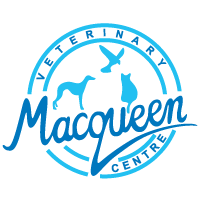 We at Macqueens will do all we can to ease you through the process and help you with the various options available so you can choose how you want to say goodbye. My pet is getting old, and I think it is time he was put to sleep – what do I do? If we have not seen your pet recently, we would recommend a consultation to discuss his health and quality of life. Nowadays there are many lines of treatment that can put him ‘back on his feet’ and we would prefer you were both given any options available. However in some cases this is not appropriate and as ever, you know him better than anyone; euthanasia is there to relieve suffering. Can he be put to sleep at home? Yes, we are more than happy to do this and will arrange a mutually convenient time. The vet will usually be accompanied by a nurse to help hold your pet for the procedure. In many cases this is the ideal solution, but for nervous pets it can be disturbing for strangers to come to the house. What happens if we bring him to the surgery? We prefer to use our quiet consulting room which is carpeted and less “clinical”. If at all possible, we will not ask you to stay in the waiting room, but go straight into the room so you can get settled. The vet will then come and examine your pet and discuss the procedure with you. We prefer to borrow your pet briefly to place an intravenous catheter into his leg. This means that you can hold him in your arms or in the case of a large dog comfort him on a mattress whilst he is actually receiving the injection, as there is no need for him to be held still as when a needle is being used. Afterwards you may choose to spend some time alone with your pet to say goodbye and remember the good times. You may wish to take a sample of hair as a keepsake. When you are ready we will then show you out via a side entrance. What do we do afterwards? You may choose to take your pet home afterwards for burial in the garden or to use our cremation service, Companions Haven. With Companions Haven you can choose whether or not to have the ashes returned to you. if you choose an individual cremation, with return of ashes, there is a choice of receptacle of which we can advise you. Our local crematorium is in the countryside north of Bristol and they are happy to welcome you if you wish to take your pet there yourself. They can also arrange to collect your pet from your home. Otherwise we usually will have the ashes delivered back within 6 days and we will contact you as soon as they arrive. This is completely natural and we all understand this. We are happy to talk everything through with you both at the time and afterwards. We also recommendThe Pet Bereavement Support Service run by SCAS and the Blue Cross. Call the support line on 0800 096 6606 (UK only including northern Ireland). The support line is open from 8.30am – 8.30pm every day. All calls are confidential and free from a landline. If calling from a mobile phone, some phone networks may charge. Support is provided by trained volunteers. Sometimes, it’s easier to write about how you are feeling rather than talking to someone, for email support from the PBSS: [email protected] Emails are answered as soon as possible and within a maximum of 48 hours. If, however, you want to contact someone immediately, please use the telephone support line 0800 096 6606. 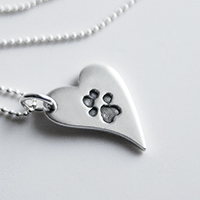 Petite Paw Prints are a Calne-based jewellery design company who specialise in making handmade bespoke keepsakes for pet owners. We understand how quickly your furry friends grow and how important it is to have a beautiful keepsake that captures those special moments. Click here for more information. The loss of a family pet is often a child’s first encounter with death and we feel that is very important that it is handled as well as possible. There are useful leaflets available on the SCAS website and also a recommended reading list. The Pet Bereavement Support Service at SCAS has a range of leaflets available to download. Alternatively, you can complete the order form online and they will post the leaflets to you. When should I pay for the euthanasia? We feel that it is often best to settle in advance so that we do not have to delay you afterwards or worse have to send statements in the post. We also legally have to ask you to sign a consent form to ensure that we are carrying out your wishes.